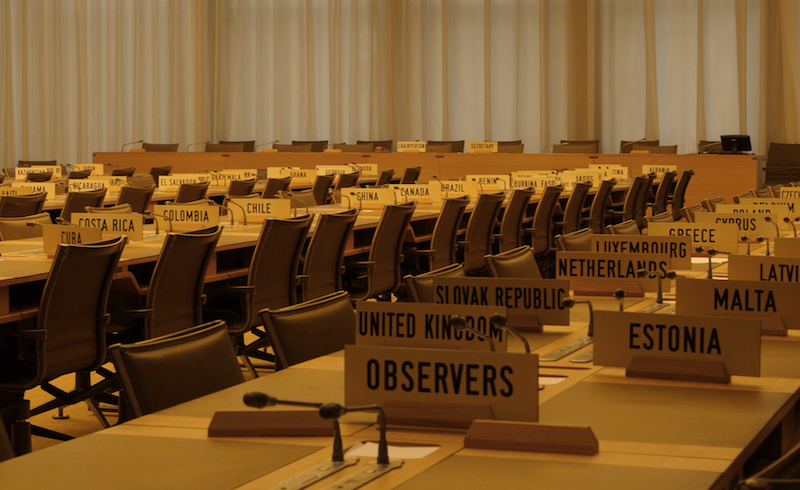 The Walls of the WTO, drawing on Quinn Slobodian’s recent book, revisits the history of twentieth-century ideas of the world economy through a single building: the Centre William Rappard on the shores of Lake Geneva. Opened in 1919 as the original headquarters of the International Labour Organization, the building’s walls were covered with images of workers toiling and relaxing in paintings and murals — gifts of trade unions and partners from around the world. In 1977, the building was taken over by the GATT, which later became the World Trade Organization, and many murals were covered over, discarded and lost. The art that replaced them depicted a world economy of objects, commodities, and flows — and, in one case, a canvas of pure white. In the process of re-branding after the 1999 protests in Seattle, the WTO restored and recovered many of the old murals in a superficial attempt to express globalization with a human face although little else about the organizations changed. The Walls of the WTO reflects on the way we see the global economy and the ghosts that haunt it. Commissioned by the Jewish Museum Hohenems for the exhibition “Say Shibboleth! On Visible and Invisible Borders,” opening in April 2018. Ryan S. Jeffery is a filmmaker. His most recent film is All that is Solid Melts into Data.